With snow on the ground and in the forecast, you may not be thinking Spring Break is just around the corner but it happens to be little more than a month away. And if you’re planning a staycation, it’s not too early to sign your kids up for camps that will keep them entertained. Activities fill up fast so check these options out. COMMUNITY SCHOOL. In the past the Community School has offered Lifeguard Training for ages 15+ during Spring Break. Information was not available at press time so check their website and/or call 503.740.7184. LAKE OSWEGO PARKS AND RECREATION. 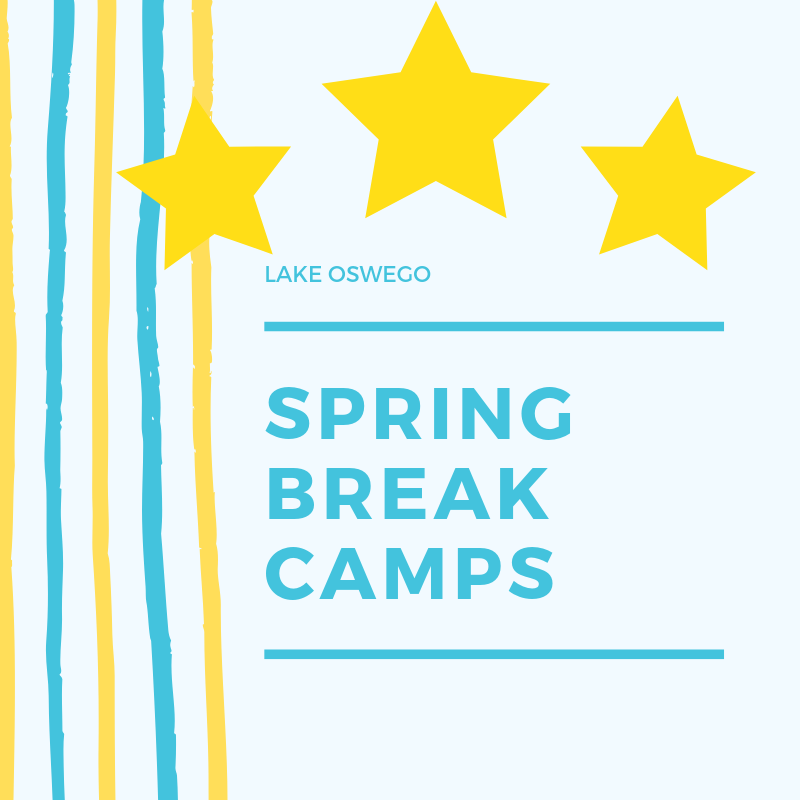 Please note that this year there is no before, after, or in-between care offered for Spring Break camps. Register by calling 503.675.2549 or on their website. ■Little Ninjas Camp for ages 6-8. Watch the transformation as campers build strength, agility and confidence through challenging games and obstacle courses. Monday, March 25, through Friday, March 29 from 9:00 a.m. to 2:00 p.m. at Mary S. Young Park, 19900 Willamette Drive. Fee for Course #18935: $230/Resident; $265/Non-Resident. ■Beginning to Rock Camp for ages 5-7. Consider this a rock immersion course for youngsters as RMC staff introduce them to the tools of the trade: bass, drums, guitar, keyboard and vocals as well as music fundamentals: pitch, harmony and rhythm. Monday, March 25 through Friday, March 29 from 9:00 a.m. to 12:00 p.m. at Christ Church Parish, 1060 Chandler Road. Fee for Course #18659: $147/Resident; $170/Non-Resident. ■Harry Potter Magical Engineering with LEGO® Materials for ages 5-7. Play-Well Teknologies staff will harness your children’s natural curiosity for how things work and love for all things Harry Potter to instill some principles of engineering and problem-solving as they construct the Hogwarts Express Train and the Hogwarts Castle. Using Platform 9 ¾. Monday, March 25 through Friday, March 29 from 9:00 a.m.t lo 12:00 p.m. at Christ Church Parish, 1060 Chandler Road. Fee for Course #18657: $183/Resident; $210/Non-Resident. ■Harry Potter Master Engineering with LEGO® Materials for ages 7-12. Your child will hone his or her magical and STEM skills using Build Diagon Alley for a trip to Hogwarts School of Witchcraft and Wizardry. Monday, March 25 through Friday, March 29 from 1:00 p.m. to 4:00 p.m. at Christ Church Parish, 1060 Chandler Road. Fee for Course #18658: $183/Resident; $210/Non-Resident. ■School’s Out—Let’s Go Fishing! For ages 7-14. Kids will explore local fishing holes and different “angles” on fishing covering rods and reels, fly fishing, tackle, cleaning fish, bait and primitive fishing methods. Transportation off-site provided as needed. Monday, March 25 through Friday, March 20 from 9:00 a.m. to 1:00 p.m. at Mary S. Young Park, 19900Willamette Drive. Fee for Course #18750: $184/Resident; $212/Non-Resident. ■Spring Break Farm Camp for ages 5-12. Luscher Farm is home base while campers learn about organic gardening, seed starts, and how to plant vegetables. Other activities include farm based crafts and feeding the chickens. Monday, March 25 through Friday, March 29 from 9:00 a.m. to 1:00 p.m. at Luscher Farm, 125 Rosemont Road. Fee for Course #8733: $160/Resident; $200/Non-Resident. ■Intro to Fencing Camp for ages 7-12. Learn the basic skills of this Olympic sport that challenges quick thinking, coordination, strength and agility. All equipment provided. Tuesday, March 26 through Thursday, March 28 from 1:00 p.m. to 4:00 p.m. at Christ Church Parish, 1060 Chandler Road. Fee for Course #18916: $100/Resident; $115/Non-Resident. ■Wild Survival Camp for ages 6-9 and 9-13. Kids will learn shelter and fire building, food and water acquisition, cordage, tracking and more in this wilderness survival camp utilizing team scenarios. Monday, March 25 through Friday, March 29 from 8:30 a.m. to 3:00 at Mary S. Young Park, 19900 Willamette Drive. Fee for Course #18749 for Ages 6-9 and #18751 for ages 9-13: $265/Resident; $305/Non-Resident. ■Junior Golf and Tennis Camp for ages 7-13 gives kids a chance to learn the basics of each sport with Monday/Wednesday sessions at the Indoor Tennis Center and Tuesday/Thursday sessions at the Golf Course. Equipment available for those who do not have their own racquet or clubs. Monday, March 25 through Thursday, March 28 from 10:30 a.m. to 12:00 p.m. Fee for Course #18877 for ages 7-10 and $18878 for ages 11-13: $120/Resident; $150 Non-Resident. ■Intermediate Junior Golf Camp for ages 12-15. Time to take their beginning experience to the next level learning how to choose clubs, execute better shots, chip and putt at competitive level. Wednesday, March 27 and Friday, March 20 from 1:00 p.m. to 3:00 p.m. at the Lake Oswego Golf Course, 17525 Stafford Road. Fee for Course #18879: $100/Resident; $125/Non-Resident. ■Nerdy Nummies. This interactive camp will introduce kids to the delicious treats inspired by the popular YouTube show including Dinosaur Fossil Cake and Moon Phase Macaroons. Runs from March 25 through March 29. Sibling discounts available. 1-2 year olds from 9:00 a.m. to 12:00 p.m. Fee: $40 for half day; $85 for full day until 4:00. 3-8 year olds from 9:00 a.m. to 12:00 p.m. Fee: $35 for half day/$65 for full day until 4:00 p.m.
■Spring Break Sewing: Poufs! For ages 8 and up. Create a different project each day. Monday, March 25 – Poufs (#134), Tuesday, March 26 – Unicorn pillow and headband ($102), Wednesday March 27 – Fur Tote and Patch Pouch ($115). Most supplies included except for pillow insert. Hours: 10:00 a.m. to 3:00 p.m. each day. Bring your own lunch. ■Poop and Emoji Cookies. Back by popular demand from last year! Kids get to make two different kinds of cookies: sugar cookie they can decorate as emojis and a chocolate cookie that looks like…emoji poop! Tuesday, March 26 from 10:00 a.m. to 12:30 p.m. Cost: $52. ■String Art for Boys and Girls ages 8 and up. Kids will be amazed at the images they can draw by weaving string in and out of strategically placed nails. Wednesday, March 27 from 10:00 a.m. to 3:00 p.m. Cost: $109. ■Scented Soy Candles and Spa Products for ages 8 and up. Supplies included to make bath bombs, rainbow soaps, bubble bars, Skittle flavored lip balm and candles. Thursday, March 28 from 10:00 a.m. to 3:00 p.m. Cost $108. MOUNTAIN PARK KIDZONE. Register in person at Mountain Park Clubhouse, 2 Mt. Jefferson Terrace in Lake Oswego. 503.635.3561. ■Spring Break Camp for ages 5-12 from 7:30 a.m. to 6:00 p.m. on Monday, March 25 through Friday, March 29 includes sports, swimming and pool activities, arts and crafts, games and more at Mountain Park Clubhouse, Mt. Jefferson Terrace. Full Week Fee: $250/ Mt. Park members; $325/non-members ($50 discount for siblings). Full Day Fee: $55/members; $75/non-members ($5 sibling discount). Register at front desk. Call for information: 503.635.3561. Spring Break can be a good time to look at homes for sale in Lake Oswego if you’re thinking of moving. I’ll be around so give me a call at 503.939.9801. Would love to show you around. I update this post every year so be sure to subscribe to my blog so you don’t miss out on the latest edition! This entry was posted in Holidays in Lake Oswego, Lake Oswego Recreation, Spring Break in Lake Oswego and tagged Lake Oswego Oregon, Spring Break, Spring Break in Lake Oswego Oregon. Bookmark the permalink.